Filled with gourmet snacks and the freshest fruits, this basket is a wonderful choice for any occasion. Whether you’re sending birthday or get well wishes, saying thank you, or expressing your condolences, this same day gift basket is the perfect choice. All of our same day gift baskets are one-of-a-kind creations and are custom made by hand so each one will be different. 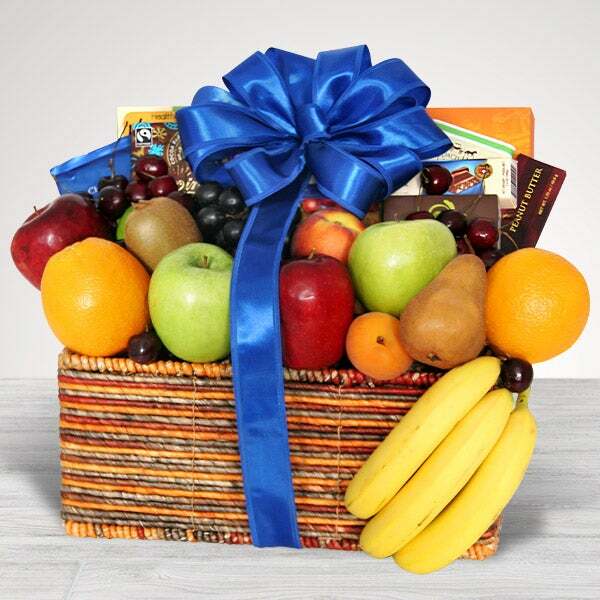 The item pictured is a sample fruit & gourmet snacks basket, but the actual item delivered as well as its container will vary depending upon local availability. The quantity and selection of fruit and snack items will change depending upon the size of the gift purchased.